As a big proponent of Lena Luthor and Supercorp, the Kara and Lena ship, I adored this episode. The end was intriguing. Lena, we are lead to believe, is even better at chess than Lex. Now, does this mean she’s better at playing good and hiding her true colors, befriending a Super before ultimately turning out to be their enemy? I think that’s what the show’s suggesting but I honestly think it would be more interesting if it turned out that Lena is just a good egg trying to make it through the world with an evil family. 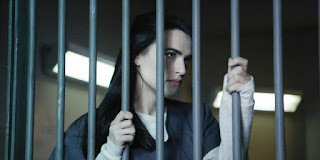 Whether or not Lena ultimately turns out to be a big bad, she was innocent this week, framed by her mother and Cyborg Superman (who, frustratingly, is still just a Cyborg, not a Superman). The trouble we go through to get our children to open a biometric safe full of weapons, am I right? Maybe it’s because I just watched last week’s Agents of SHIELD as I’m sitting down to write this, but Lillian’s anti-alien sentiment just feels…done. I’m sorry but Agents of SHIELD is doing this better. I wish Metallo would get a new shtick. At least Lillian’s motivations are all tangled up with her affection for her son and some serious crazy. I will say, with all the Luthors and all the talk about Lex it feels weird we’ve never seen him. I mean, we did get baby Lex in this episode, but it feels a little bizarre to have his presence so felt, especially in this episode, without a face to stick to it. We’ve seen Superman and that was so much fun. Is it so wrong for me to want a deeper look into this universe? I want to meet Lex. And Lois! I’ve been complaining about the show doing too much so it’s probably coming across hypocritical that I want them to add more characters but how much fun would it be if Kara had to go to Metropolis for an episode or two? I think my favorite moment this week was probably Lena shouting “Don’t hurt her!” at her mother. That and Lena sending Kara an office-ful of flowers. And the implication that Kara carried Lena in her arms away from a fiery explosion. Is it any wonder I ship these two? Plus their chemistry is off the charts and, I’m sorry, but I’m just not seeing it with Mon-El. Maybe I’m wary of investing in Mon-El as a character because I really can’t see him surviving the season? The whole will they won’t they thing they’re creating could so easily be leading up to Mon-El sacrificing himself for Kara in very dramatic fashion. Lena Luthor feels more permanent. Like she’s going to be around a while, whether as Kara’s friend and ally or as something more sinister, only time will tell. The whole big fight scene was enjoyable as hell, especially when J’onn showed up. I know they can’t use him like this all the time because it’s Kara’s show but it is fun to see them fighting cape to cape. Baby Lena is seriously one of the cutest things I’ve ever seen. I really hated James' reasoning behind blaming Lena. If she'll betray her own mother, what won’t she do? Really? She betrayed her mother to save lives. Now saving people is suspicious? I get that he’s prejudiced against Lena because of her brother, but that was a real logic pretzel. Katie McGrath is just earth-shatteringly beautiful. A couple of episodes back, they did something with Lena and Winn and I thought that was the direction they were going. Guess not, judging by Winn's reaction this week. And yes, Riverdale is deliciously fun, despite my misgivings. I don't know what to do with Supergirl. I have dropped the show twice, but then I was thinking it might get better... And then I realize that that was exactly what I was thinking with Smallville and wasted 10 years (!!!) on a show I didn't appreciate. Hmmm...what to do? And I don't look forward to the musical ep. Can't stand musicals. Lena is great! I totally agree that last scene where they discussed the flowers, hard not to ship those two. I noticed Katie McGrath's Irish accent sneaking out more than I ever have in this episode! She does a pretty good job though normally. Grumpy TJ, I'm having the same issues with Supergirl. Except for a few good episodes here and there, I barely pay attention to it when it is on. However, I am looking forward to the musical. I love musicals, I wish in real life that people would spontaneously start singing and dancing. Well, as long as they are good singers. I spent about 5 minutes at the SPN Karaoke before I couldn't take it anymore. I thought they are going to spring the Mon-El secret plot at the end but I only got it right that there will be a cliffhanger. I also would love to see Lena upgraded to series regular. She is the de facto replacement for Max Lord after all. He's not missed.